Dorothea Veronica was born on May 27, 1923 to Theodore “Ted” and Ida (Klug-Kelm) Blume. She was baptized at home soon after birth into Trinity Lutheran Church in Faribault; 95 years and 148 days ago they were not sure she would live very long. She grew up on a farm in northern Steele County, Minnesota enjoying the farm and her family of parents, 3 brothers (Gerhardt, Willard, and Martin), and 2 sisters (Emma and Serena) had to offer. She walked or traveled in a horse drawn wagon to a 1-room schoolhouse 2 miles from home with her siblings. When she was 8, her mother passed away. Without a mother in the house, she quickly adapted, learning to cook and do other chores with her siblings as the need arose. Later, in her late teens, Dorothea moved to Minneapolis and worked as a bus girl at a hotel while attending beauty school in Minneapolis. She then worked as a beauty operator and an elevator operator for Dayton’s department store during and after World War II. She met her husband, Donald Zabel, in Minneapolis after Donald had faithfully served his country as a Marine in the Pacific Theater during World War II. They married on September 26, 1947 at Mount Olive Lutheran Church in Minneapolis. Sometime later, they bought a small house and moved to St. Louis Park, Minnesota. Dorothea gave birth to her son, Bradley, in 1954 and to her daughter, Joan, in 1956. She stayed home to care for her children and would continue to care for and nourish their physical needs and provide for the spiritual foundation of her children throughout her life. The family moved to a larger home still in St. Louis Park in 1960 and started attending St. Luke’s Lutheran Church. In 1966 the family moved to Denver, Colorado and joined Trinity Lutheran Church in Denver where she served on the altar guild as well as many other church ministries for many years. Later, with her children out of the nest and when Don retired, Square Dancing and Marine Corp Reunions became a big part of her life, providing she and Don with recreation, social activities, and travel opportunities. Dorothea and Don also traveled to Europe in 1980 for several weeks while their son, Brad, was living there. Her granddaughters Lisa, Wendy, and Erin brought great joy to her life from the time they were born during the 1980’s. After 62 years of devoted marriage, Dorothea’s husband, Donald, passed away on October 1, 2009. She would be a widow for the next 9 years of her life. Shortly after Donald’s death, she moved to an elder independent living apartment in Littleton, Colorado and enjoyed the activities and the company of the other residents in the complex. 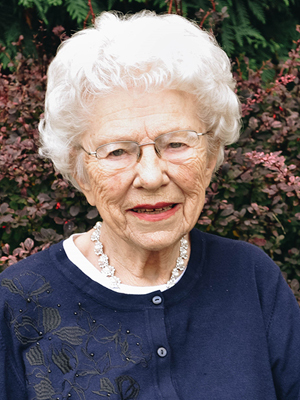 Just weeks after celebrating an exciting 90th birthday party in May of 2013 in Colorado, she moved back to Minnesota into an assisted living facility near her daughter, Joan. In Minnesota, she could enjoy gatherings of her nephews and nieces more often as well as visits with family and old friends with Joan’s help. She greatly anticipated these family gatherings on holidays and she looked forward to the annual family reunion picnic often mentioning the event months in advance. In 2016 she made the difficult, though much needed, move to the memory care part of this same facility, McKenna Crossing. It was difficult being away from the interaction with people in the high traffic parts of the facility that she had enjoyed so much. Many at the McKenna Crossing staff were very sad to hear of her passing. She had brought much joy to their lives too. Today the earthly part of Dorothea’s life long steadfast faith journey ends where it began almost a century ago at Trinity Lutheran Church in Faribault. This journey continues now with constant joy in the loving presence of her Savior forever. Dorothea is survived by her sister Serena (Richard) Eastling of Lakeland Florida, her son, Brad of Severance, CO, daughter, Joan (John) Harig of Shakopee; granddaughters, Erin Shannon, of Las Vegas, Lisa (Josh) Reiher of Columbia Heights, Wendy (Eric) Kunde of Maplewood; and one great-granddaughter, Hannah Reiher.